A poem / prayer by Eric Sabelman, shared at the MVPJ vigil on July 26th 2006. Here, take an olive branch. 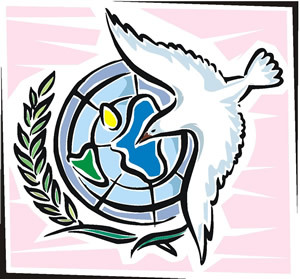 The olive branch is an ancient, near-universal symbol of peace. For over 1100 years, the winners of the original Greek Olympics were given olive branches as a sign of nonviolent victory. The American eagle holds an olive branch in one talon, but a sheaf of arrows in the other. One of the emblems of the Israeli Defense Forces is an olive branch wrapped around a sword. The coat of arms of Pennsylvania has an olive branch paired with an ear of corn. The flag of the United Nations has a pair of olive branches encircling the Earth. If you are a follower of one of the religions whose scripture begins with Genesis, you will be familiar with the olive branch brought to Noah by a white dove, as a symbol of the end of worldwide disaster and the beginning of God's forgiveness. But what if Noah ignored the dove? What if he had not seen the olive branch? You hold an olive branch; what would you do? You can drop it at Noah's feet - or whoever claims to steer the ship of state - and go get another. You - and all of us who would serve the role of doves - may drop another olive branch, and another, and another. In not too long, the message of the olive branch will be piled so high it cannot be ignored. The steersman will see no course ahead but toward the olive branch.